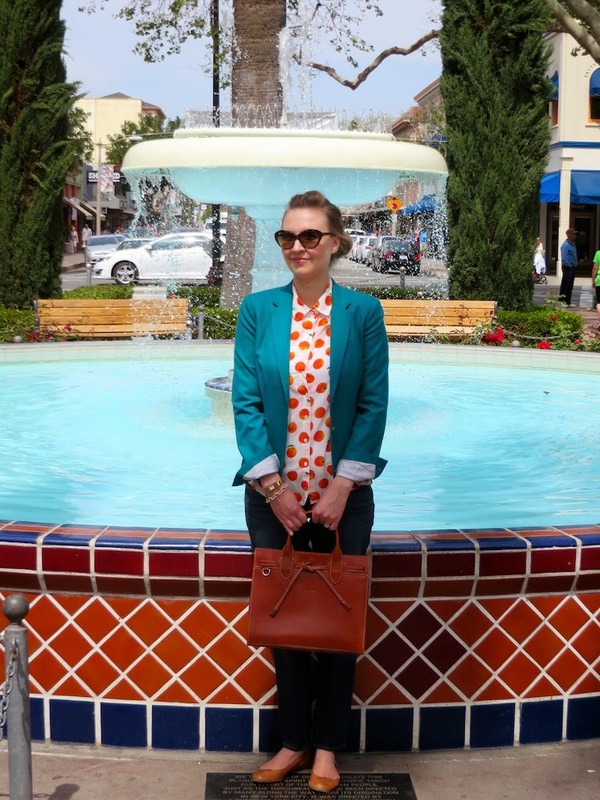 Well, my orange/citrus print shirt is back for spring and I was back in the city of Orange yesterday too. For those of you who live in the Los Angeles area you may know that the city of Orange is located in, where else but, Orange County. 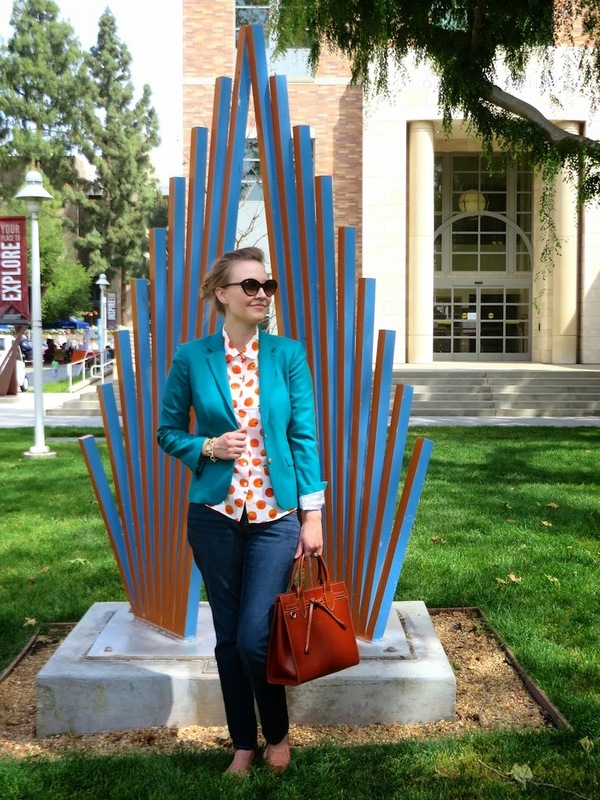 It is the home of Chapman University as well as a charming old downtown area. My husband and I spent the afternoon strolling through its numerous antique stores looking at furniture, art, and nick-knacks as well as perusing some other interesting shops. One such shop was a Native American store featuring feathers, leather, pelts, beads and other Native American themed items. Downtown Orange is quite the eclectic place and I highly recommend a visit if you're in the area. Below you will see my orange shirt (and me) around town in the City of Orange. I couldn't think of a more perfect thing to wear to this once vital town in California's booming citrus industry. By the way, my shirt has now been reissued by the J. Crew Factory. So it's back in more than one way! This is a random sculpture that was on the campus of Chapman University. It is from 1983 and I thought the colors matched my outfit perfectly! 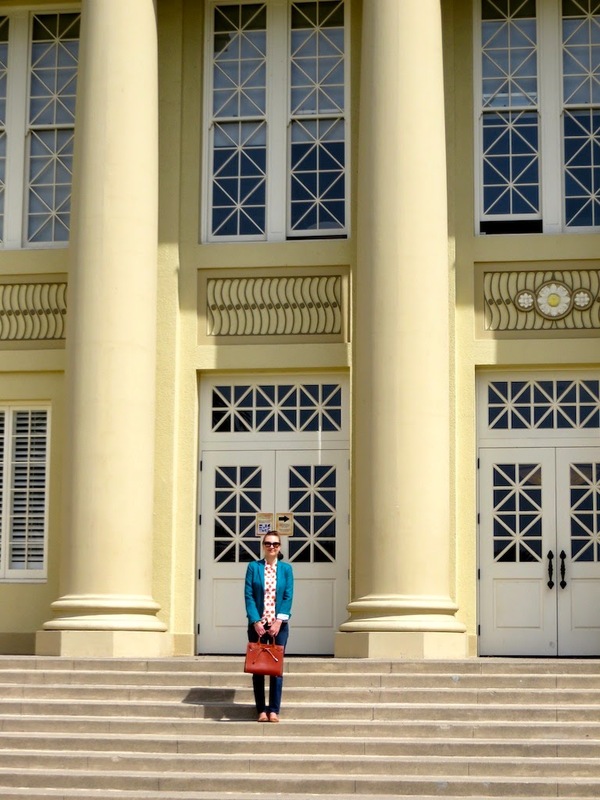 Here is my orange shirt and me standing on the steps of one of the lecture halls on the Chapman University Campus. This is a fountain in the heart of historic downtown Orange. I went to the town last year and photographed it as well as other sights here. Above is just a random picture next to some orange flowers. 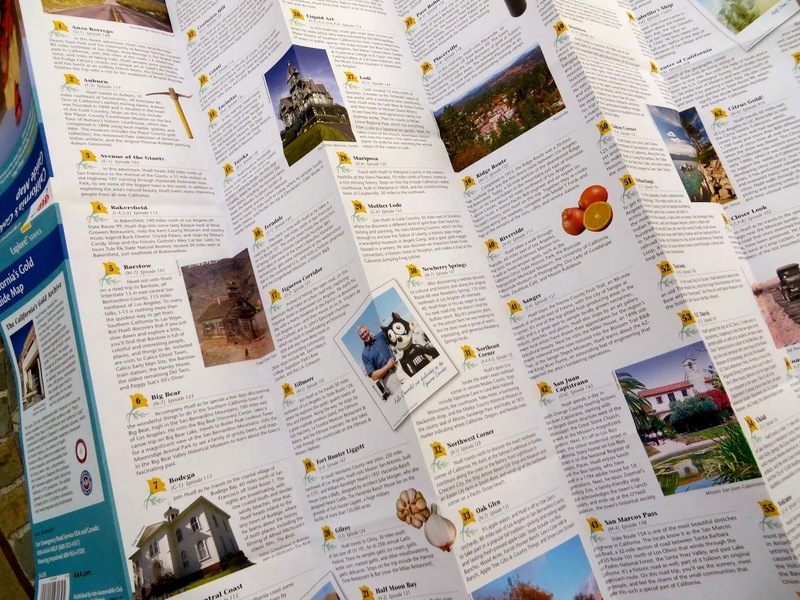 Below you will see pictures of the AAA Huell Howser travel map that I picked up at Chapman University. Huell Howser donated his collection of books, artifacts and other possessions to the University after his death, as well as establishing a scholarship in his name. Today the university opened up their permanent exhibit on Huell Howser and gave away these maps detailing places Huell visited on his travels. My hope is to go on as many of these adventures as possible. Since I think I'll be living in L.A. for quite a while I should have plenty of time to get this done! Ohh Katie you look great here! I love the fact that you coordinated your outfit to your destination! I seem to have a weird obsession with "theme dressing"! :) Thanks Laura!